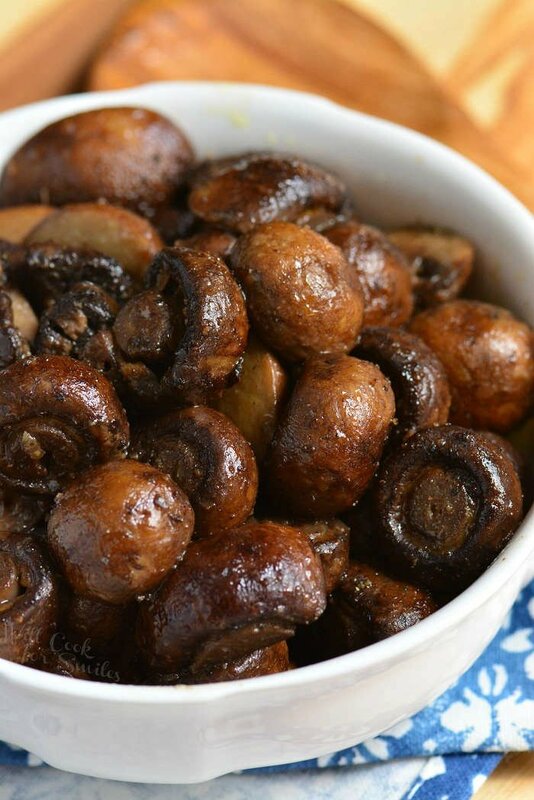 These buttery Roasted Mushrooms make a beautiful side dish that goes perfectly with many main dishes. 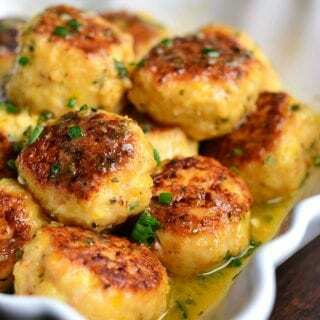 Firm, meaty crimini mushrooms are simply seasoned and roasted until tender. Roasted mushrooms are then tossed lightly with butter and garlic mixture for the perfect bite. 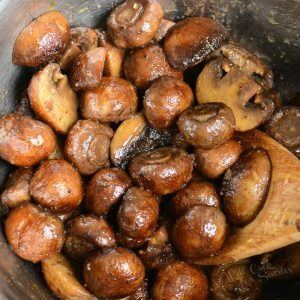 Mushrooms make a great side dish and some of my other favorites include creamy Mushroom Julianne and Baked Mushrooms in White Wine Sauce. 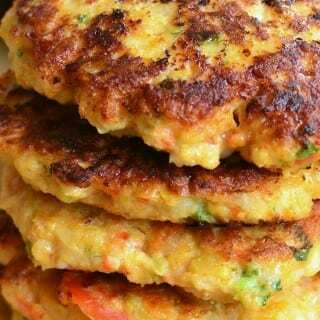 Simplest dishes are often the best ones. These simple roasted mushrooms taste great and pair perfectly with a big, juicy steak and many other beef dishes. 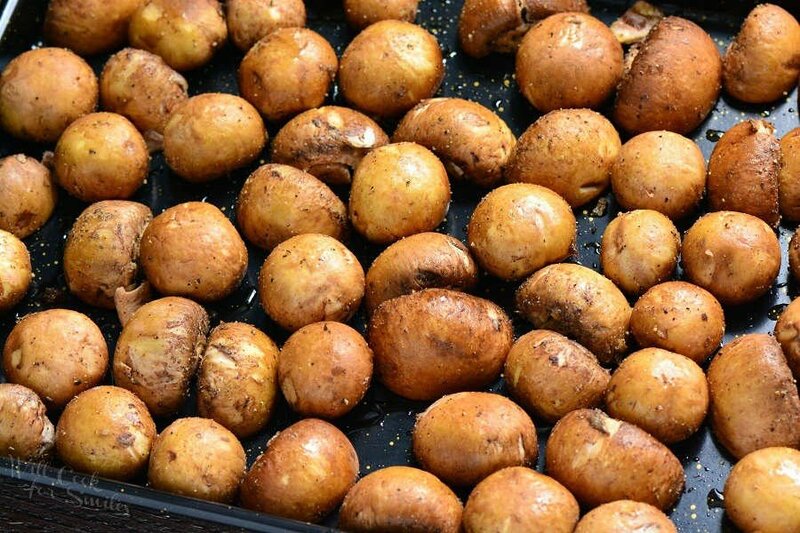 What makes these roasted mushrooms the best? The simple seasoning on mushrooms is really the way to go. You don’t want to overload mushrooms with many other flavors because the mushroom flavor will be lost. 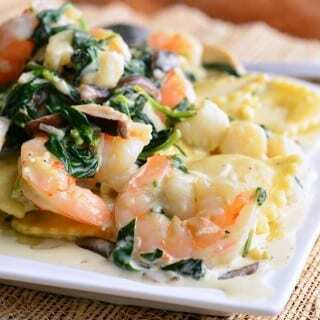 Mushrooms taste great on their own and a little flavor enhancement is all you need. So I simply season mushrooms with salt, fresh cracked black pepper, and garlic powder before roasting. After mushrooms have been roasted, I add fresh garlic, butter, and a little more salt if needed. To roast mushrooms, I only use olive oil. Mushrooms are basically sponges, so when I tried to toss them in butter before roasting, they soak up everything and then I end up adding even more butter. To avoid butter overload, toss roasted mushrooms in a little bit of melted salted butter that’s flavored with garlic. That’s the perfect finishing touch for firm, buttery, garlic roasted mushrooms. I often spend a long time trying to go through all the packs of mushrooms at the store, trying to pick the best ones. Ideally, mushrooms would not be pre-packaged so that people could select the best ones. There are some stores which do have loose mushrooms available. If your grocery store has loose mushrooms available, that’s the best way to get fresh mushrooms that are firm and are all similar in size. Always try to pick out mushrooms that are firm and have no brown spots. Don’t press on the mushrooms too hard or you will bruise them. Feel them gently with tips of your fingers. For most commonly used mushrooms, it’s best to clean them with a damp paper towel. Cut bottoms of the stems off first. (If you wish, you can but off the whole stem or leave part of it on.) Use a damp, not soaking wet, paper towel to wipe dirt off of each mushroom. While wiping each mushroom is a tedious task, especially when preparing a lot of crimini (aka baby bella) mushrooms, it is the best way to clean it. Why wipe off each mushroom instead of washing them all with water? Mushrooms are basically sponges and easily soak up all the water and other liquid that they’re exposed to. 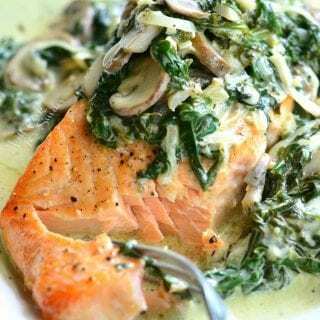 If you expose mushroom to even more water while washing them, they will soak up too much water and will be too soft, mushy, and watery when cooked. If the task of wiping off each mushroom is too much or you’re just short on time, there is a quicker way you can wash them. Place all the mushrooms into a colander. Quickly rinse excess dirt with cold running water. Use dry paper towel to dry off mushrooms as fast as possible. The goal if to expose mushrooms to as little water as possible. Store Fresh mushrooms unwashed in the original packaging. Original package will most likely have holes poked though so that mushrooms can breathe. Don’t try to seal mushrooms air-tight. Loose fresh mushrooms can be stores in a brown paper bag or ventilated vegetable container, in the refrigerator. 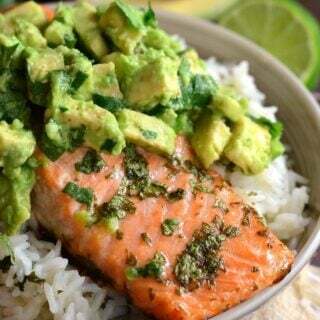 Don’t wash clean until ready to cook. Fresh mushrooms can be stored in the refrigerator for about 2 days. After that, mushrooms will start to soften and go bad. Store Cooked Mushrooms easily be stored in a plastic food storage container with a lid. 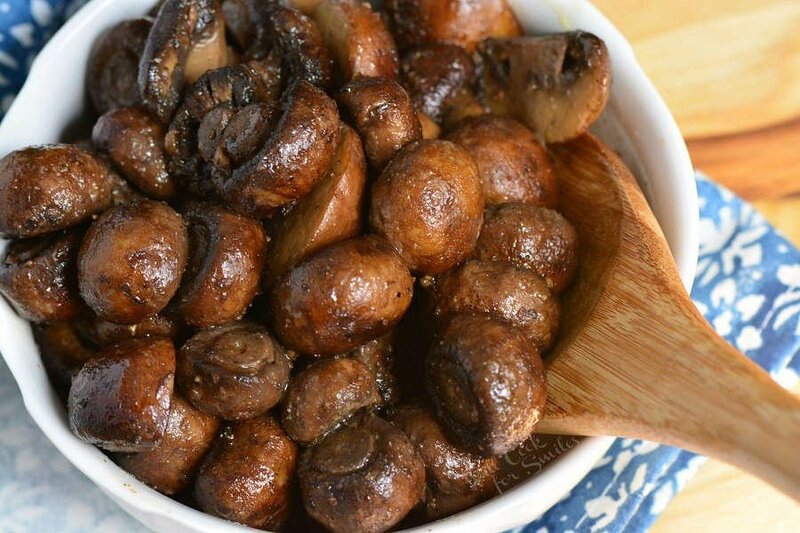 Store cooked mushrooms in an air-tight container in the refrigerator for up to 3 days. 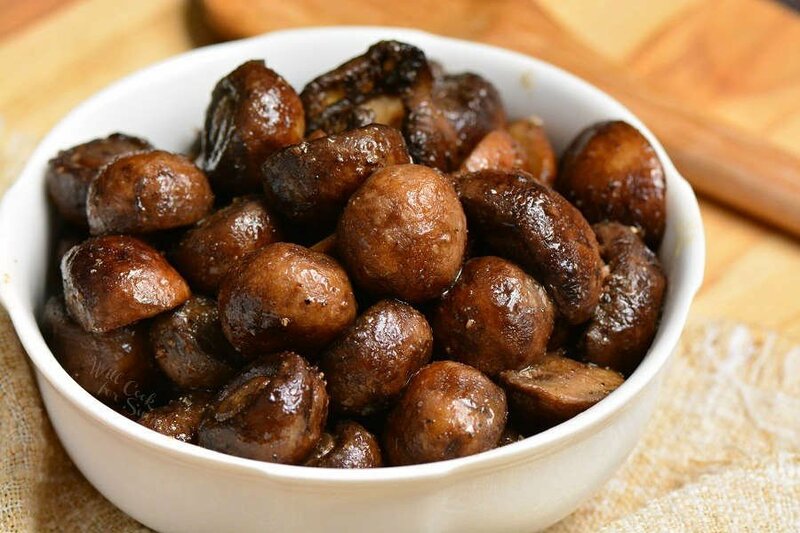 Firm, meaty crimini mushrooms are simply seasoned and roasted until tender. Roasted mushrooms are then tossed lightly with butter and garlic mixture for the perfect bite. 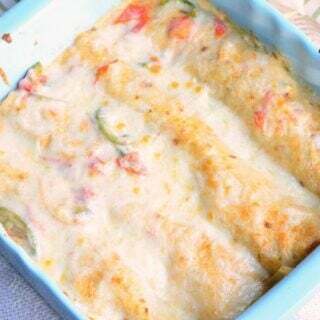 Preheat oven to 425° and lightly grease a large rimmed baking sheet. Baking sheet should be able to fit all the mushrooms in one even layer. Cut bottoms of the stems off mushrooms and wipe mushrooms clean with a damp paper towel. If some mushrooms are too large, cut them in half. 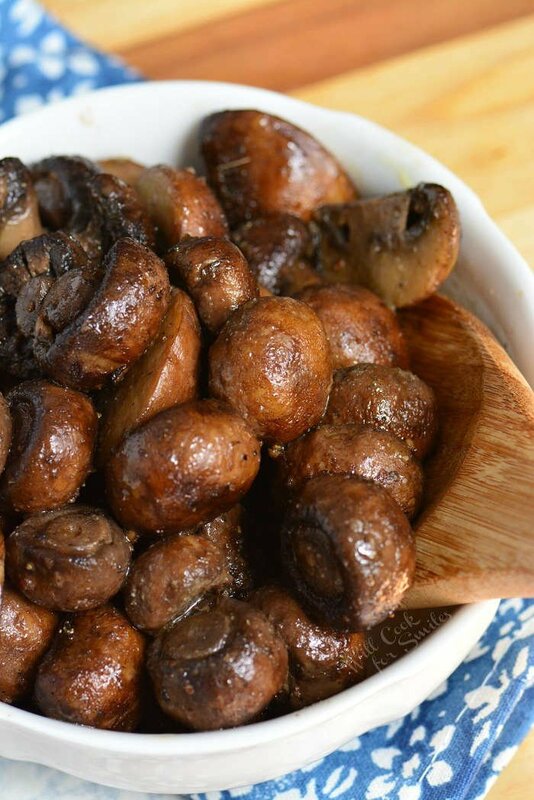 Place mushrooms in a mixing bowl, add olive oil and quickly toss all the mushrooms. Add salt, pepper, and garlic powder and toss mushrooms to evenly coat them in seasoning. Spread mushrooms in one even layer on the prepared baking sheet. Turn each mushroom stem side down. Melt butter and mix it with pressed garlic while mushrooms are baking. 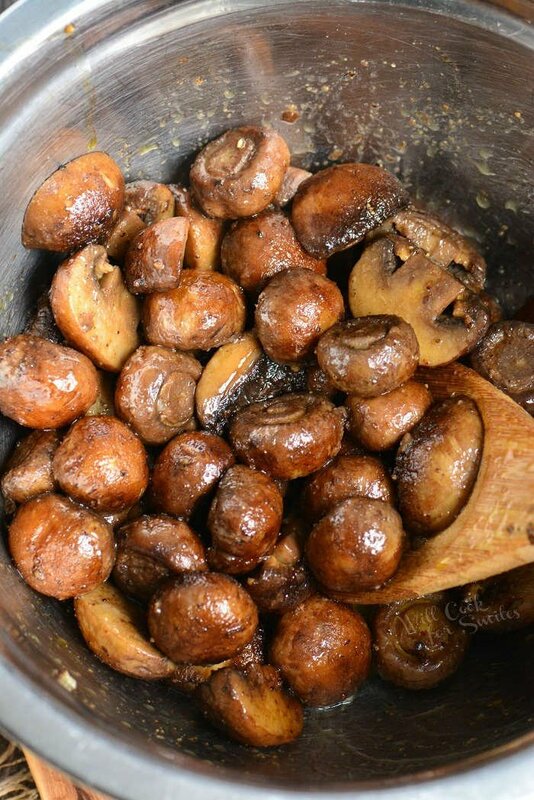 Once mushrooms are done, toss them in a clean mixing bowl with melted butter and garlic mixture.